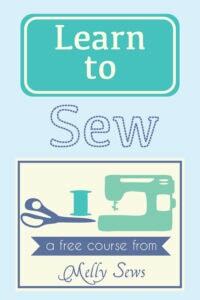 A last minute tutorial, for anyone who plans to spend part of Christmas Eve sewing (like I often do). Is there anything cuter than a toddler in footy pajamas? I don’t think so. And if you have a toddler that won’t stay under a blanket and likes to pull his socks off, they’re not only cute, they’re very practical for keeping adorable tootsies warm. However, we had 2 problems with footy pajamas that I needed to solve. 1) We are potty training Bean, and have no time to waste with traditional one-piece footy pajamas. 2) There are no matching footy pajamas that I can buy for the Christmas pajamas I made Tater. And matching pajamas are a must for Christmas morning pics in our house. So, I give you the footy pajamas tutorial – these are meant to be added to the bottom of regular elastic waist pajama pants, the kind that can be sewn very quickly and made for Christmas Eve. The kind like this tutorial from Made, or this tutorial from My Cotton Creations. You do need to make sure that whatever pants you’re adding these to go all the way to the bottom of your kid’s heel in length. 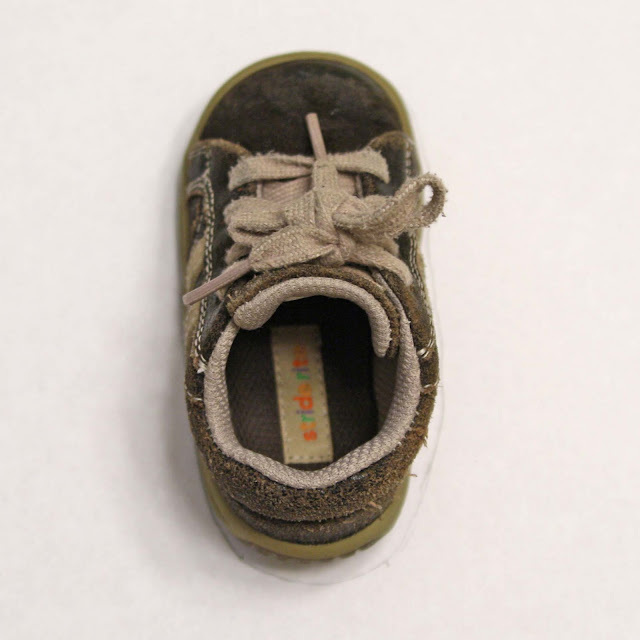 First, you need your kid’s shoe. 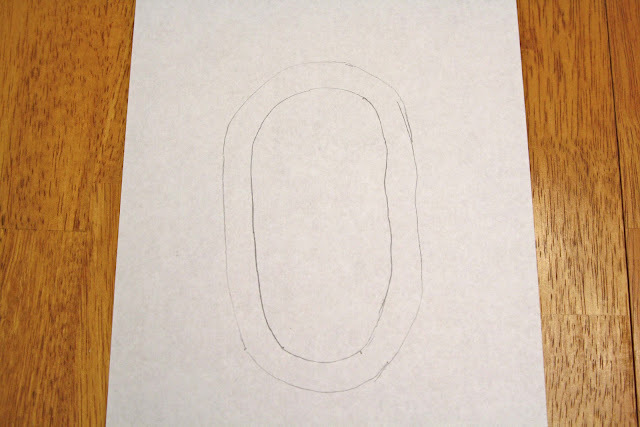 Trace it onto some paper. Add a seam allowance around the tracing. Don’t add a seam allowance. I’ve made several more pairs of these and the shoe shape itself is enough of a seam allowance bigger than my kids’ feet. I cut out two feet from flannel and two from fleece for the insides. To make sure Bean didn’t slip and fall while running and wearing these, I used fabric paint on the soles. 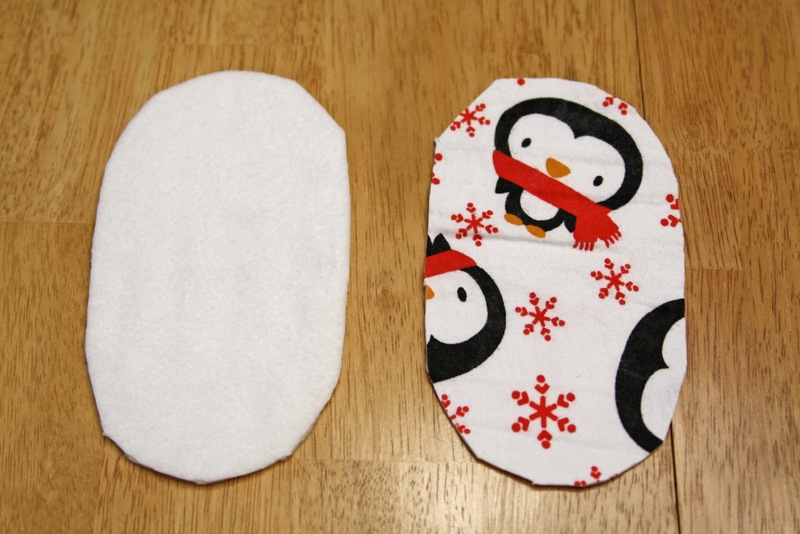 You could also buy non-slip fabric for the soles. I just squiggled it on and let it dry. These are the two pieces for the top of the foot. 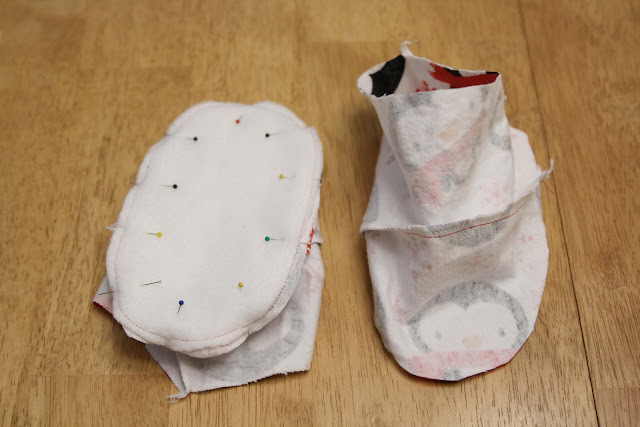 The toe piece is equal to the foot piece folded in half long ways, plus seam allowance (do add this one). The flare on the sides is about 1/2″ on each side. On the cuff, the center is equal to the top of the toe piece, and the two sides are each equal to 1/2 of the back circumference of the foot (fold foot in half long ways, measure around curve) plus a seam allowance. The cuffs are 3 inches wide. I kind of eyeballed the angle on the cuffs. Once you sew the cuff to the toe, sew up the back seam of the cuff, so you’re pieces look like this. Now take that piece and turn it right side out, and turn your pajamas inside out. Stuff the foot into the leg, making sure the center back seam of the cuff is lined up with the center back of the leg. Pin and sew around. If the cuff is a little larger than the leg or vice versa, don’t sweat it. 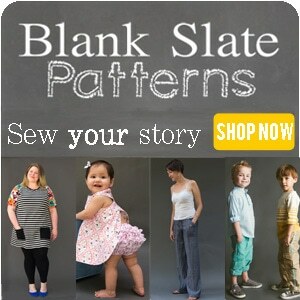 Add tiny gathers or pleats – they won’t show after the elastic is added in. VERY IMPORTANT- sew this part with a large seam allowance – I used 3/4″- and don’t serge it. This will be used to make the elastic casings, so you want enough fabric. 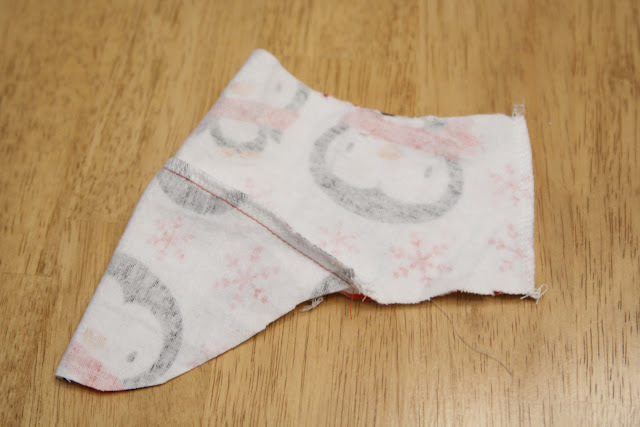 Now turn the seam allowance up, and carefully sew it down, leaving at least 1 inch open, to make an elastic casing. Run elastic through the casing and sew it shut. Now here we’re going to run into a little “do as I say, not as I show”. You see, I actually sewed the foot bottoms on mine 3 steps ago. But I didn’t tell you, because I realized (too late) what a colossal pain in the patootie it was to not have the bottoms open when you’re sewing the cuffs to the legs. So your feet should be attached at the cuffs right now, not free floating like in my picture below. 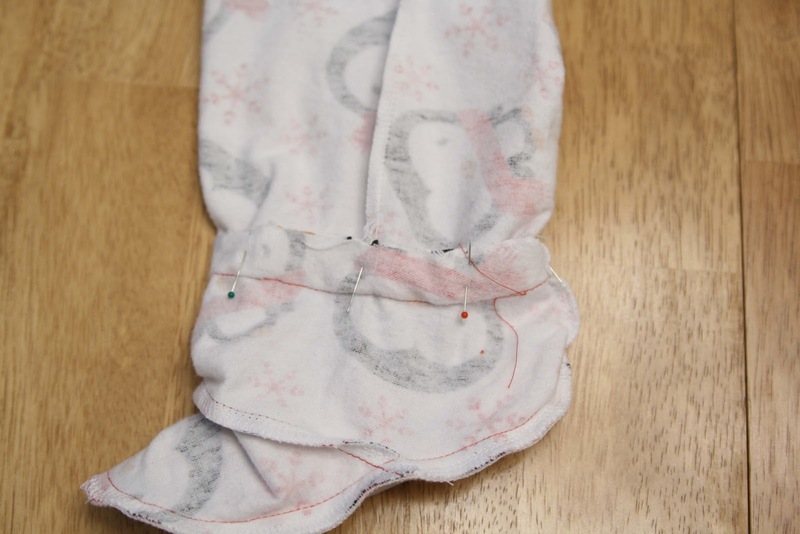 But, follow the same principle to baste the fleece to the wrong side of the foot piece, then pin and sew the whole thing to the bottom of the foot piece that is attached to your pajama leg. 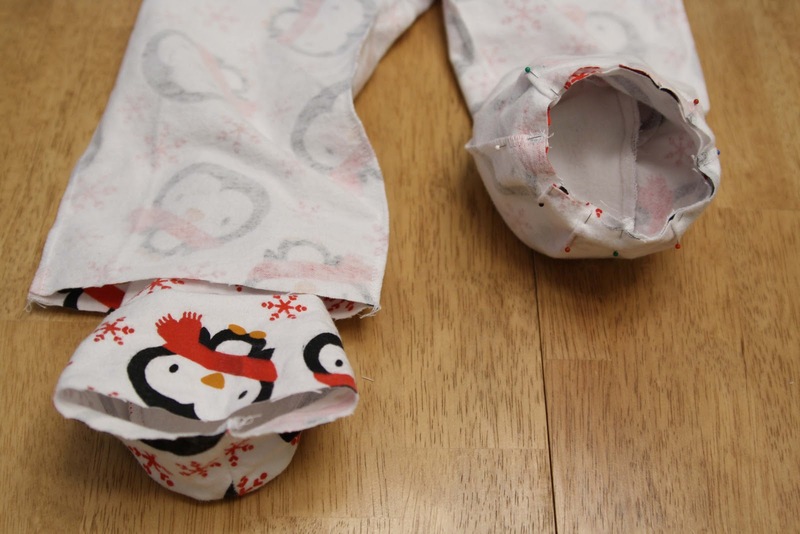 And now turn those puppies right side out, and warm some toddler tootsies with them! For the pajama top, I made a Raglan Sleeve T-shirt with long sleeves, and appliqued a couple of the penguins from the flannel on the front. Brilliant! I so want to try this! Sooo cute! I’ll have to make some of these for my little guy, thanks for sharing!!! Love it! Footy pajamas are so precious!! I’ve never thought about making them. Thanks for the tutorial! 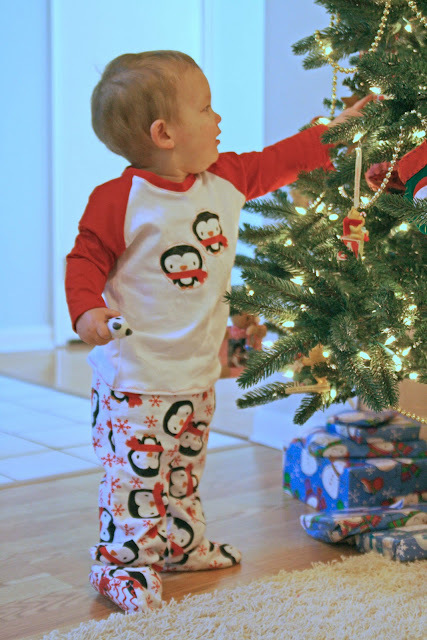 Those are the cutest pj’s ever! What a great idea! Thanks for the tutorial! I saw you on Craft Gossip! Very clever! Thanks for sharing it!! I’ll save it for future use! Hope you and your family have an wonderful 2012!! Love this! Have to try it out for my new nephew! how have i missed this!!! kid number three on the way, and the others are 2 and four so lots of footie love at our house!! Can I copy this tutorial with my copier. I don’t see a print sign. Great help. Just what I was looking for. If you’re asking how to print the tutorial for your own personal use, you’d need to go to file>print in your web browser program. If you’re asking if you can make copies to distribute, no, you cannot. This is copyrighted material. What if I wanted to sew footies onto a pair pj’s with the stretch cuff/or/sweats? I have been searching for a separate bottom pattern with feet to no avail. Thanks so much for this tutorial. It’s been over 7 years you published this, and it’ still very useful. 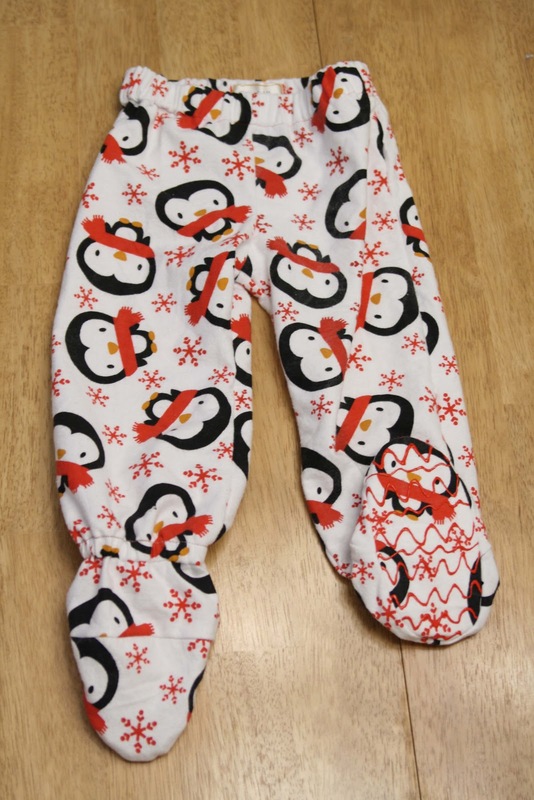 I believe pyjamas should all come with 2 pairs of footed pants for babies, just so it saves not to have to change them end to end when not necessary. 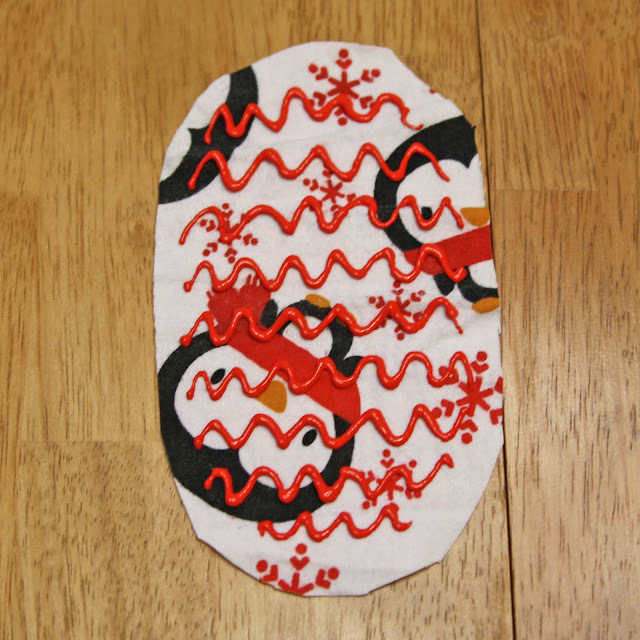 Besides the pattern itself, I love the idea of simply squiggling fabric paint on the soles so they are not slippery as opposed to non-slip fabric which is nice but quite a bit more costly. Thank you on both counts! All the best to you!